This discussion was created from comments split from: Feature Request - Bring Back the PIN Code access. The PIN code option for IOS has disappeared from Security > Settings with the last update. I am now required to enter my (long and complicated) master password, instead of the PIN code, every time I start the app. "Lock On Exit" is, and has always been. turned off. AutoLock after 15 minutes is turned on as there is no "never" option. Same problem with both my iPhone (6+) and my new iPad Pro 9.7". I have submitted this to support through the app, but the automated reply isn't any help either. Please restore the PIN code option (my preference) or add a "never" option to Autolock. Sorry to hear about the trouble here. I see you also emailed us. Just for future reference it isn't necessary to contact us both via email and here in the forums. Doing so causes a duplication of efforts, and slows down the support process for everyone. But since I have you here now let's see what we can figure out. We have no plans to offer PIN unlocking on devices that have Touch ID enabled. 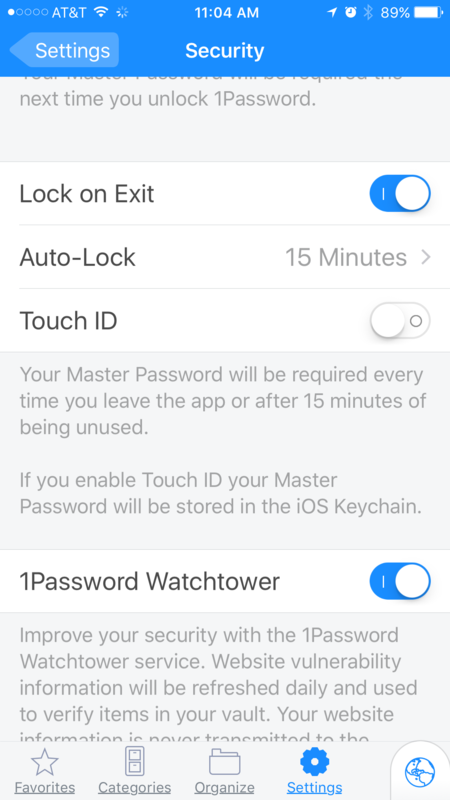 If you'd like to unlock 1Password with a PIN you'd need to disable Touch ID on your device (Settings > Touch ID & Passcode). I hope that helps. Should you have any other questions or concerns, please feel free to ask. Thanks! Thank you for your reply, Ben. I do not have touch-I'd enabled on either device. My fingerprints are mostly not consistently readable due to injury, age, etc. Point is that the PIN code option was available in the past, and I used it, and the option has now disappeared. Thanks, @DearlG. Could you please take a screenshot of the 1Password > Settings > Security preference pane and post it here for us? Thanks, @DearlG. 1Password thinks you have Touch ID enabled, even if this is not the case. Can you please double check the settings in the Settings app under Touch ID & Passcode and make sure nothing relating to Touch ID is enabled? Ben...I checked the IOS touch-ID settings on both devices. There are (were) fingerprints stored from previous attempts to use this feature on both devices and in various apps. I deleted the stored fingerprints on both devices and returned to 1Password settings and the PIN code option has become available again and all appears well at this point. The fingerprints have been stored for quite some time now and I turn off the option in various apps as needed. Not the expert here, but it appears that a bug has slipped into 1PW to cause it to now behave this way. Thanks for the update, @DearlG. I suspect just the opposite: if you have fingerprints stored in iOS 1Password is intended to not allow the PIN, so it sounds like we fixed a bug. Glad to hear removing the fingerprints has got this working for you as you'd like. Reply was truncated. Oh well...it's working.